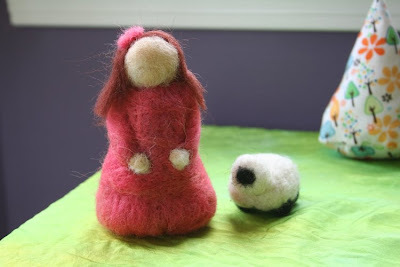 My first needle felted human form, which Elizabeth promptly named Ella, was born yesterday. Ella and Elizabeth became fast friends although Ella resides on a high bookshelf, much higher than Finn can reach. I asked Elizabeth if she was going to feed Ella her needle felted food. Elizabeth looked at me, confused, and said, "Of course not. That's my frogs' food." She's s beautiful. Nice job! I really want to try my hand at this someday. She is beautiful. Great talent! Well done! I think the comment on it being froggy food was so cute. Kids are so funny and imaginative! I guess Elizabeth will need to make some more food for the doll since she can't be eating the frog's food. :) The doll is so cute! Joy, that's great! You are getting really good at that! Do you just layer roving for the body, or do you start with a filler layer of something? How lovely! Now she couldn't be eating frog food.